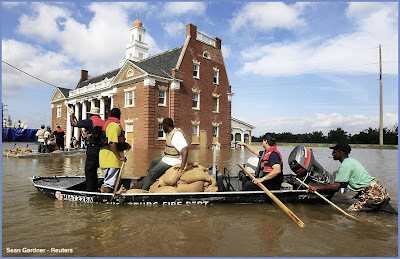 Marian is a former employee of the US Army Corps of Engineers and a lifetime resident of Vicksburg Mississippi. 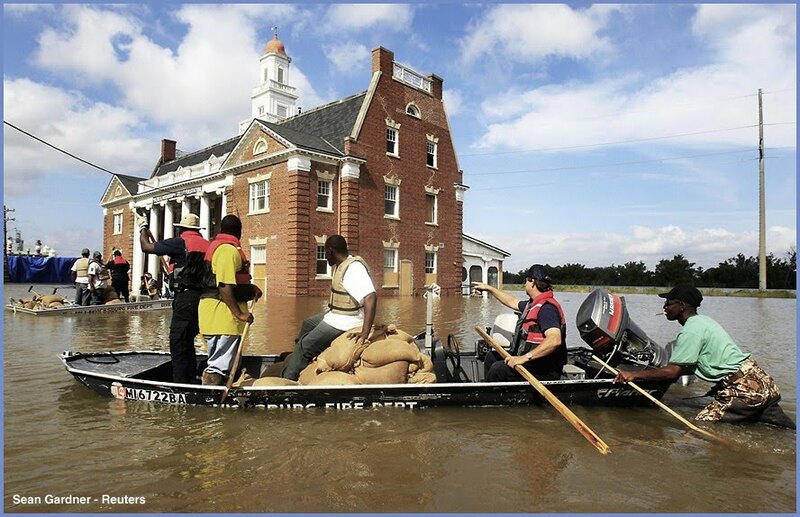 She shares my distress seeing the historic (1907) structure taking a hit like this. 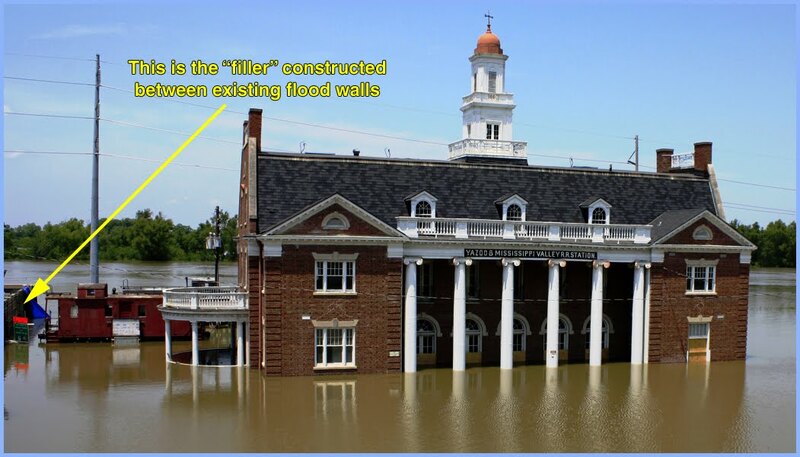 Looking carefully at the photo above, you can see a "filler" was constructed between two segments of the flood wall, excluding the station! From my "arm chair perspective," a row of HESCO Baskets may have protected the structure. 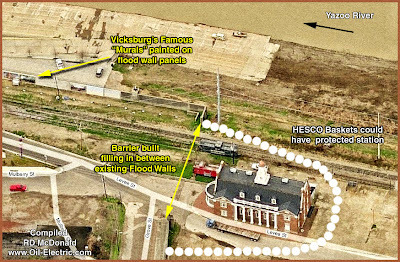 This article is a logical extension of a previous post, since this was the "Vicksburg" end of the Vicksburg, Shreveport & Pacific Railroad. Well, almost the end of the VS&PR. Passengers traveling across the states de-trained at Delta Point, the eastern terminus of VS&PR, and boarded a Mississippi & Yazoo River Packet Company Parisot Line steamboat across the river to Kleinston Landing - Vicksburg - Mississippi a distance of about a mile. 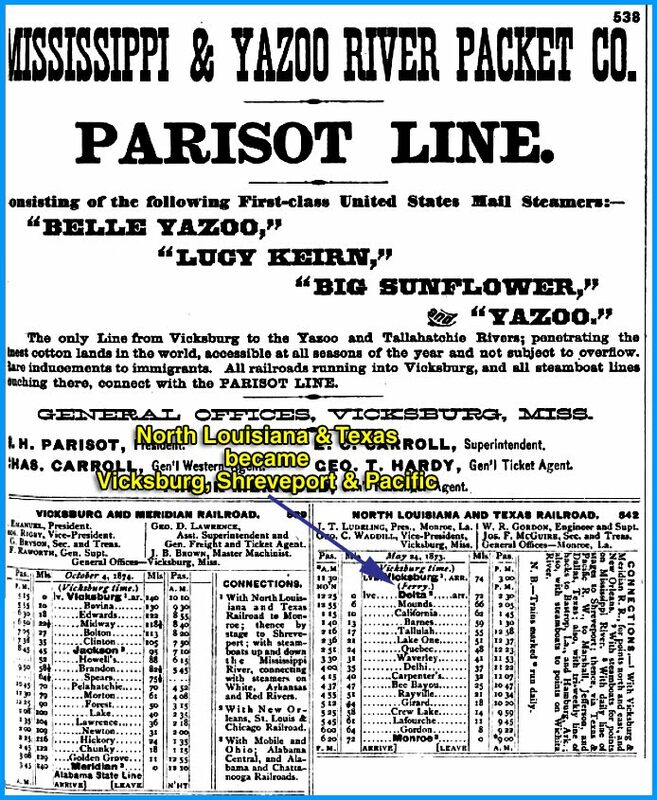 In Vicksburg, passengers could continue east to Jackson on the Alabama & Vicksburg Railroad, later the Meridian & Vicksburg. 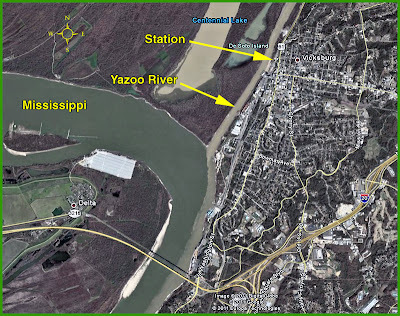 Or board the Yazoo & Mississippi River Valley Railroad, a north-south connector and subsidiary of the Illinois Central. Freight traffic faced a different set of problems. The VS&PR had earlier switched from 5' 6"gauge to 4' 8½". 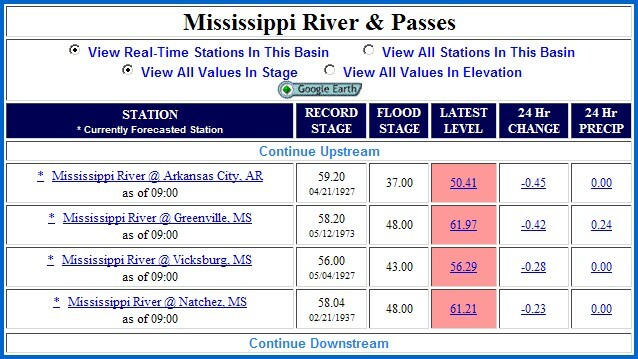 But, the Meridian & Vicksburg, nee Alabama & Vicksburg, was 5'0" gauge. So. There was no point in building a transfer barge. 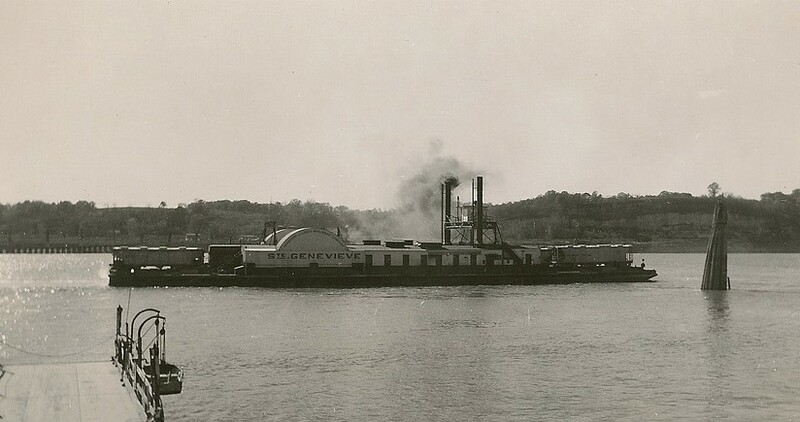 Because of these miss-matched gauges, freight had to be unloaded from boxcars, raised by elevators to the top the levees, and loaded onto barges to cross the Mississippi. 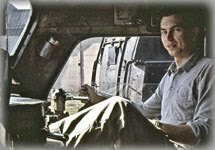 Then off loaded from barges, down the elevator, and reloaded into boxcars. 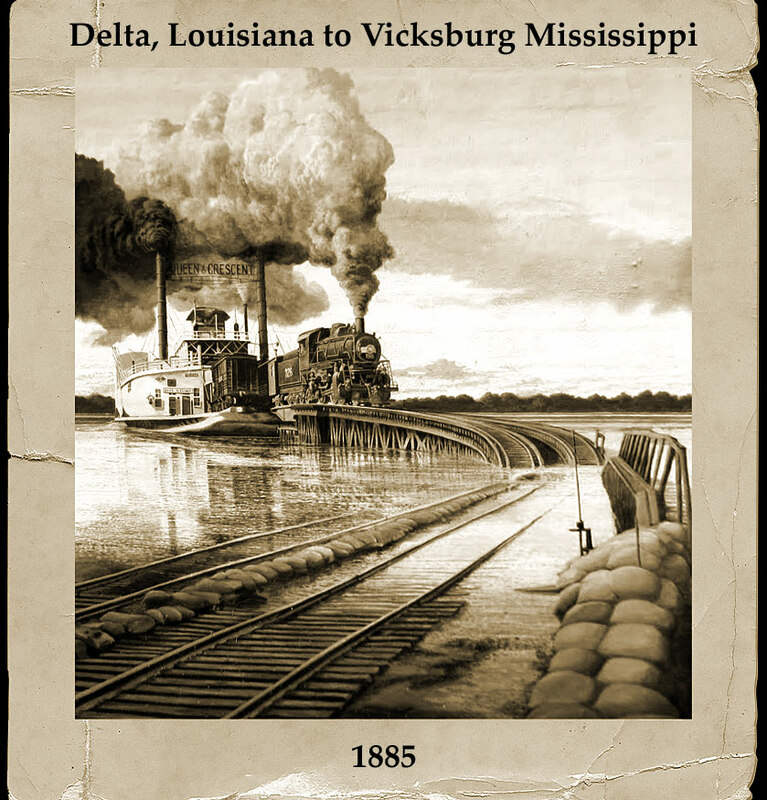 Finally, on October 22, 1885, the gauge of the entire line from Meridian to Vicksburg - 152 miles, including sidings, - was changed in about 16 hours. With rail gauges matching on both sides of the Mississippi, steamboats began transporting rail traffic across the river from Delta Point to Kleinston Landing - Vicksburg. On April 28, 1930, the first bridge to cross the Mississippi between Memphis, Tennessee and the Gulf of Mexico, opened at Vicksburg, linking Vicksburg to Delta. 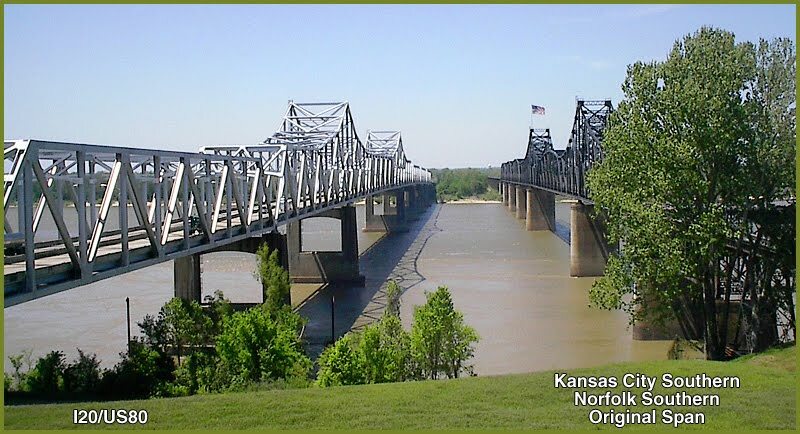 The bridge was constructed to carry not only rail traffic, by now, the - Illinois Central - but also US Highway 80. The two-mile long span has an 18-foot wide concrete motor vehicle lane, side by side with the single line railroad. Vertical clearance for river traffic is more than 100 feet. Today, the railroad, now the Kansas City Southern/Norfolk Southern, still uses the span. But Interstate 20 US 80, is carried on a parallel span completed in February 1973. 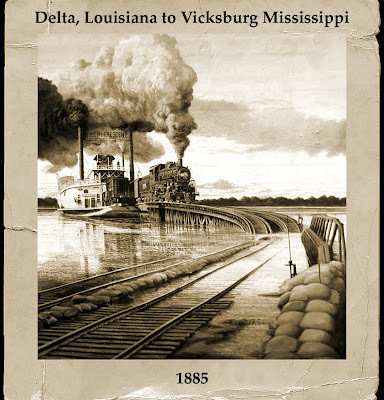 Many students of railway history are convinced that had it not been for the Civil War, the Vicksburg Route would have been a link in the first transcontinental railroad. Known as "The Thirty-Second Parallel Route," the route extending from Charleston, South Carolina to San Diego, California, through Vicksburg, Shreveport, Fort Worth, had been the dream of engineers and the theme of statesmen from the time of the great California gold rush until the outbreak of the war. Now, the east - west corridor is operated by the Kansas City Southern. A joint venture between Kansas City Southern (60%) and Norfolk Southern (40%), created the "Meridian Speedway." The "speedway" runs 320 miles from Meridian Mississippi to Shreveport Louisiana. Heavily rehabilitated, the design capacity can accommodate up to 45 trains a day, with a 65 mile per hour roadbed. 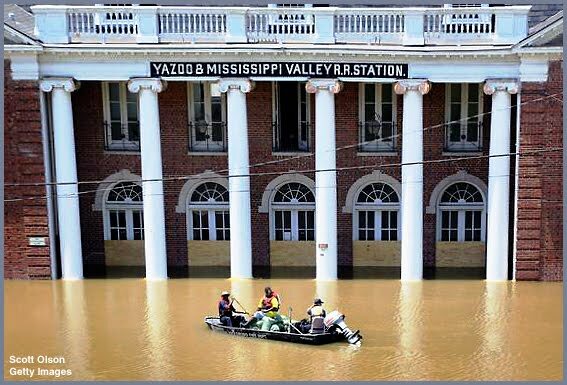 And so that's how we arrive at today's story of the Yazoo & Mississippi Valley railroad station in Vicksburg. The Yazoo & Mississippi Valley Railroad became a subsidiary of the Illinois Central in 1892. The Y&MV ran its last train on May 1, 1984. From what I can determine, the station was abandoned in the late 1950's. 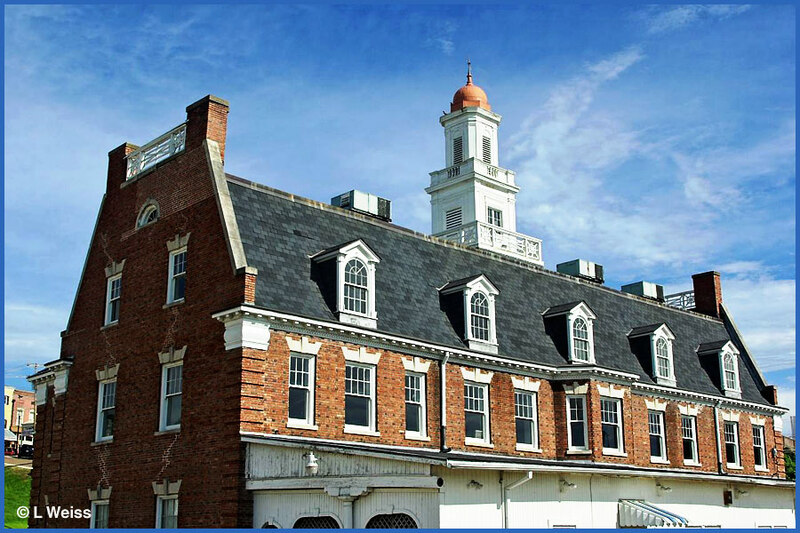 Students of architecture will tell you this is a fine example of "Colonial Revival." 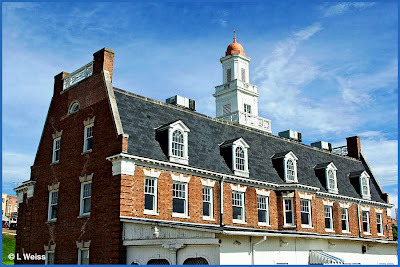 The structure was completed in 1907. 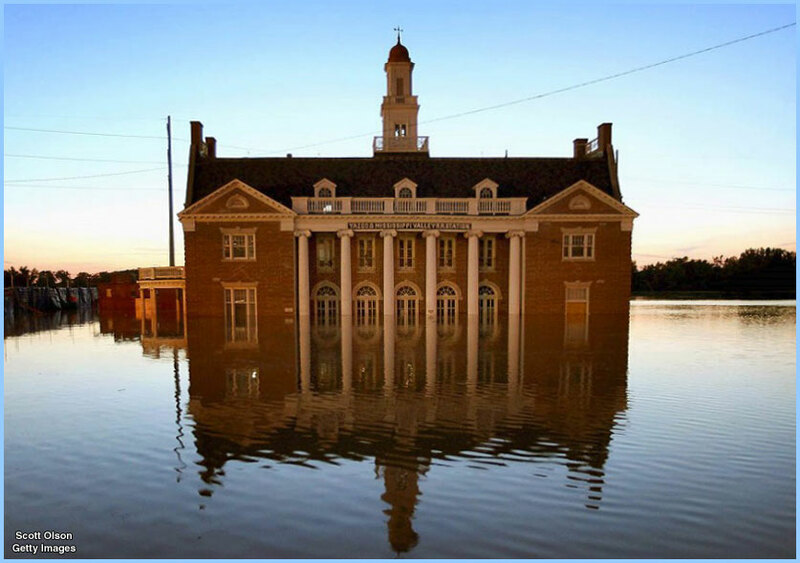 The building was purchased by the City of Vicksburg in 2001. 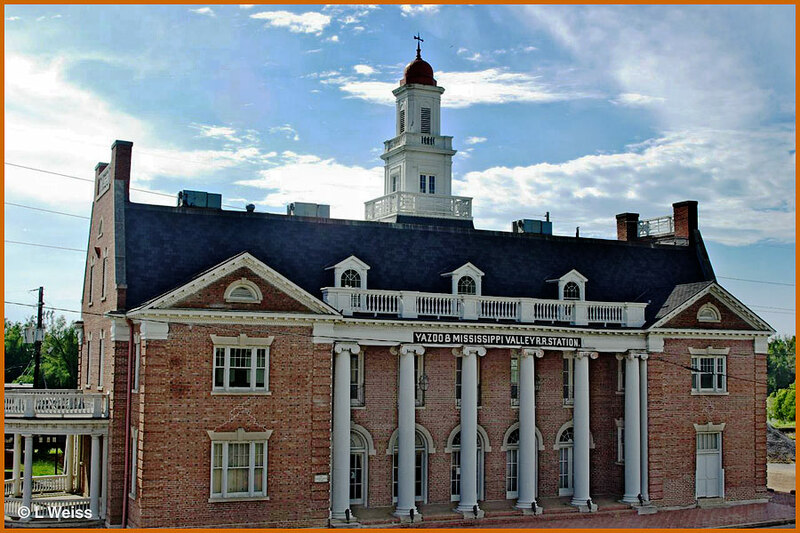 A grant of $1.6m was obtained to restore the 3-story, 14,000 square foot building and create a heritage museum, combining the history of the River and the Yazoo & Mississippi Valley Railroad. 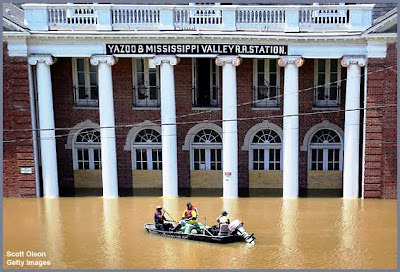 Unfortunately, the station is at a lower grade below town, and was engulfed a few days ago, by the adjacent Yazoo River. For a while, the Yazoo River actually flowed backward, yielding to pressure from the Mississippi. These photos require studying for a few moments, to appreciate the careful attention to art and form detail using brick. A lost art form for sure. Ms. Phillips tells me plans are still in the works to have the station/museum open this coming fall - providing the water goes away! 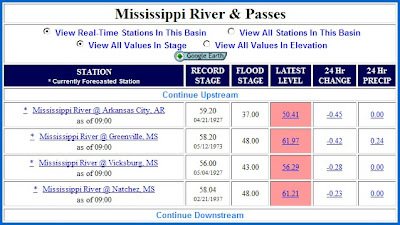 Checking the river gauge this morning shows the Mississippi is still slightly above the 1927 flood. 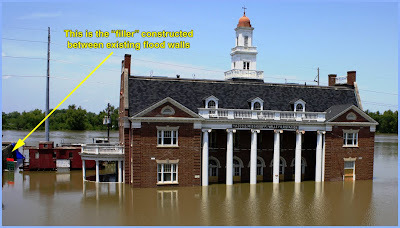 And still no answer to the provocative question, why wasn't the structure protected from flooding? 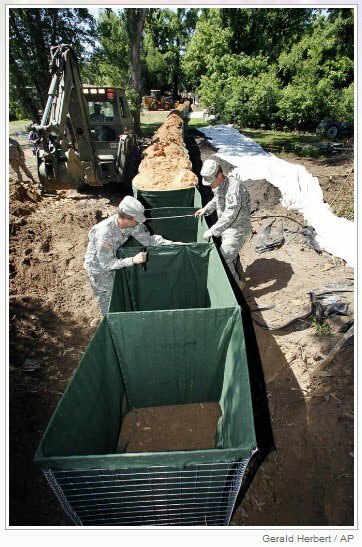 I am grateful for the assistance and photographs from Marian Phillips and Leland Weiss in writing this article.